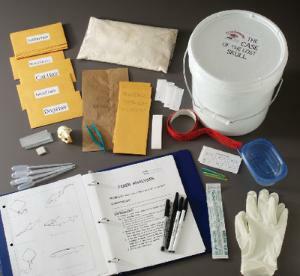 Students use deductive reasoning and forensic techniques to solve a mystery. A mysterious animal skull has been left outside your school with money stuffed inside it, a shoe print beside it, and other potential trace evidence in the area. This introductory forensic unit will show your students how to address the question of who put it there. They will analyze fingerprint, blood, hair, fiber, imprint, and documentation evidence over the course of about five days. The kit includes a binder with teacher instructions, student worksheets, and suggested cross-curricular activities, as well as enough materials for 30 students. A microscope, required, is available separately.